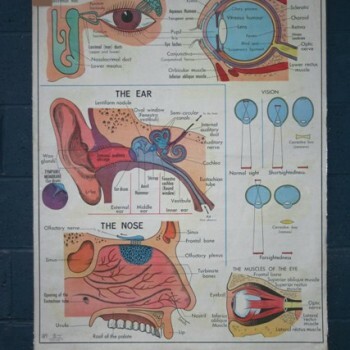 This large vintage medical poster of the the eyes, ears and nose is a quirky wall accessory in a office or classroom. The eyes section of the poster has labels and images of the eyes and how vision works. The ears and nose section of the medical poster also have labels and images labeling different sections. This vintage poster would make the perfect learning or revision resource if you're studying the human body. It would make a unique gift for a collector of vintage medical posters.